It's 1774 and British troops are occupying Boston. King George closes Boston Harbor to punish people who speak out against his laws. Henry, a young boy from Boston, hopes to try out his new sled on his birthday. But when he and his brothers and sister get to the hill they find that the troops have set up camp there. After building up enough courage, Henry asks General Gage to move his troops because Boston Common is for everyone. Being a kind man of his word, General Gage agrees and the children can once again sled. 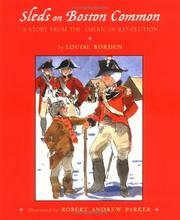 Borden, Louise, “Sleds on boston common: A story from the american revolution,” Children's Picture Book Database at Miami University, accessed April 19, 2019, https://dlp.lib.miamioh.edu/picturebook/items/show/13606.